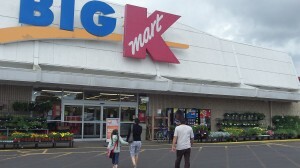 » Taking Kmart’s place is … what? Taking Kmart’s place is … what? Kmart closed in September; now something may take its place. A request to divide the tax lot occupied by the former Kmart store in Albany has touched off rumors in City Hall and elsewhere about what if anything might go there. The big question: Is Winco Foods involved? Good answers were impossible to come by on Monday night. The subject popped up at the end of the Albany City Council’s Monday afternoon work session. Did City Manager Wes Hare want to say anything about the rumor, Mayor Sharon Konopa asked him. Not really, was the answer. Rumor? Well, Hare allowed, what happened was that the city had received a land use request involving the Kmart site off the north end of Pacific Boulevard S.E. The request is to separate the Kmart location from part of the lot occupied by a Taco Bell restaurant. That’s all. Hare said the city had not been informed about any plans for redevelopment once the property is divided, and certainly no development plans had been filed. The view among the staff, though, privately expressed, seems to be that there’s a plan to turn the place into a supermarket. And Winco is rumored to be the interested party. If it’s a supermarket, and especially if it’s to be a Winco, this is not good news for people in west and north Albany, who have been pining for a supermarket chain, preferrably Winco, to reopen either the abandoned Safeway at Queen and Pacific or the vacant former Ray’s on North Albany Road. Any more supermarkets elsewhere presumably lessen the chances of one opening at either site where people want one. As it is, the concentration of supermarkets in southeast Albany, and their total absence from the southwestern and northern sectors of town, forces uncounted area residents to drive several miles each way for trips to the store. The city’s economic development program has been trying to get a company interested in the Ray’s location, having contacted Winco and others, but so far without success. I hope the rumor is true about Winco. We go to Salem from Millersburg subdivision to shop there,where we heard that same rumor from a Winco employee. I’ve heard it from my daughter who heard it from an acquaintance who works at a bank. I don’t think it is just a rumor. Also heard an employee at Walmart telling the lady in front of me that it is true. The Millersburg area could use a Winco; it would appear to be an ideal site; close, easy access to and from I-5, convenient parking. At least it isn’t a malicious rumor! I would welcome a Winco. It does seem like a good fit for the property. I live in downtown Albany, and while I miss the convenience of the ‘Old’ Safeway, businesses must be profitable. Ray’s wasn’t (alas), neither was the older grocery store across the street, where the garden store is now. Much of downtown Albany views ‘crossing the bridge’ about the same burden as crossing the railroad tracks to get to Mega Foods or Fred Meyers or Safeway, the support is not there. So as I do not shop at either Walmart , nor Safeway (due to the store brands pushing out all the brands I actually like), I shop primarily at Fred Meyers for staples and Mega Foods for fresh fruit and vegetables. But I’d give Winco a look.